Brazilian racer Felipe Massa finds a future in the FIA Formula E Championship with Venturi. After spending sixteen seasons in Formula One from 2002 to 2017 and taking a break from racing in 2018, the 37-year-old Massa will reactivate himself in the 2018-2019 Formula E season with Venturi Formula E Team. Massa signed a three-year deal with the Monaco-based team. He will begin testing an electric VFE 05 Gen2 race car by the end of this month. The fifth season of the Formula E will start at the end of the year. The calendar has not been announced yet. 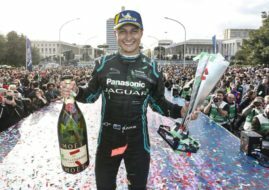 “I’m very happy to be joining the Venturi Formula E team and the Formula E championship, which has become a magnificent competition in such a short space of time. For some years now, I’ve been clear about my interest in this innovative, forward-looking discipline that’s developing exponentially. I especially like the format of race meetings, the city-centre circuits and the contact with the fans. I can’t wait to take part in testing at the end of the month,” Massa said.